Heading down to Crab Orchard. That’s part of the Appalachian Mountain range in the distance. A distant relative was filling me in on his family’s Kentucky connections and mentioned Crab Orchard. Seemed like a good enough reason for a day trip south of Lexington to find it! I found tiny Crab Orchard and was greeted by this interesting historical sign. Well, you know me–I think all those historical signs are interesting. Crab Orchard Springs: Site of popular watering place 1827 until early 1930s. 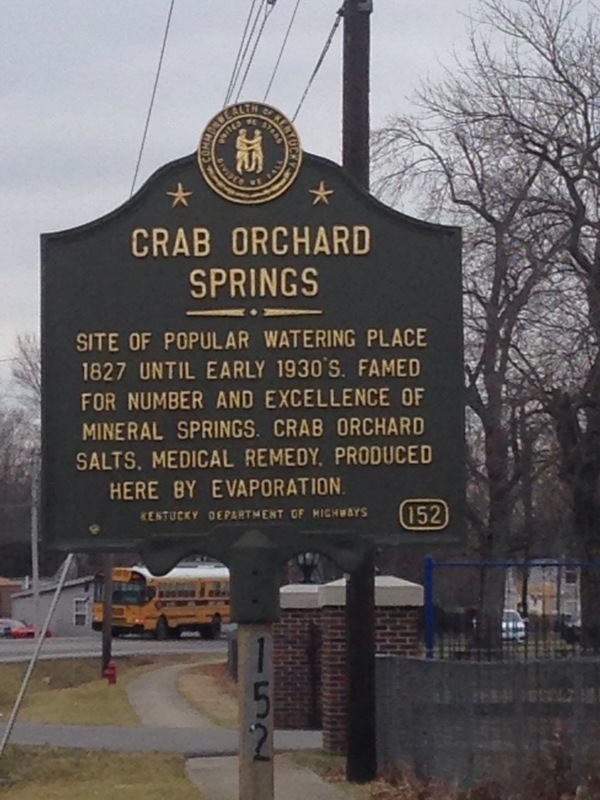 Famed for number and excellence of mineral springs, Crab Orchard Salts, medical remedy, produced here by evaporation. 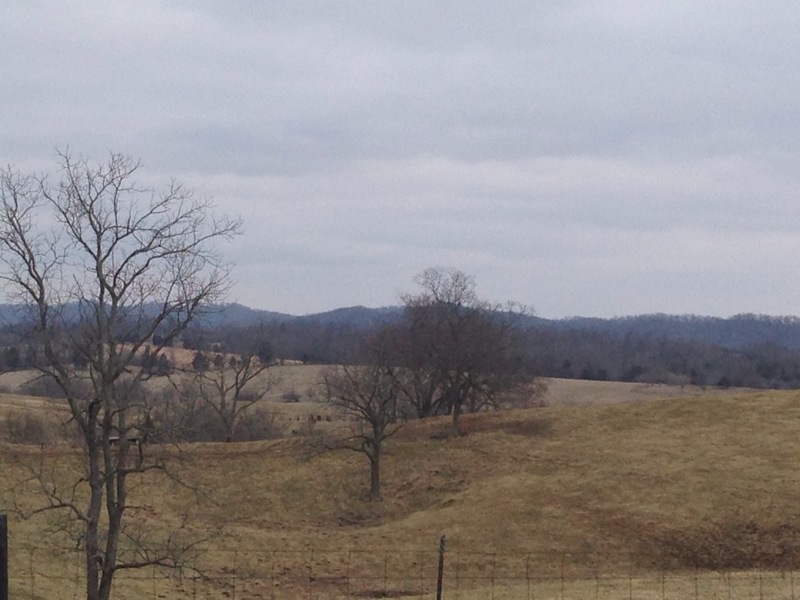 According to the 2000 census, 842 folks lived in Crab Orchard. Today it’s one of those “blink and you’ll miss it places.” But back in the day–pioneer days through the 1930s–Crab Orchard was apparently a bustling place. It was an early pioneer station (a fortified settlement) near the end of the Logan Trace of the Wilderness Road. Crab Orchard Station (1784) was also known as Moore’s Station. There is speculation that it is the same site as Baughman’s Station (1780). While the historical sign claims the mineral springs were a tourist draw as late as the 1930s, other sources pinpoint the heyday of tourist traffic to 1827-1922. There were numerous hotels and taverns located at Crab Orchard Springs during that time. A post office was established in Crab Orchard in 1815, very early in the formal postal service system, which was established in 1792. Crab Orchard was the birthplace of mountain man Thomas “Pegleg” Smith (1801-1866). He seems to have been a somewhat unsavory figure (to say the least). He must have been tough though–he amputated his own leg! Crab Orchard was a stop on the Louisville and Nashville Railroad. The L&N played an important role in the Civil War because it crossed Confederate/Union lines. Posted in Civil War, Day Trips, History, Kentucky, Pioneer Stations, Road TripsTagged Appalachian Mountains, Baughman's Station, Crab Orchard, Crab Orchard Post Office, Crab Orchard Salts, Crab Orchard Springs, Crab Orchard Station, Lincoln County, Logan Trace, Louisville and Nashville Railroad, Mineral Springs, Moore's Station, Thomas "Pegleg" Smith, Wilderness Road, Woodson Taylor WilderBookmark the permalink.